While saltwater fishing gets the vast majority of attention, Sarasota bass fishing gets overlooked. We don’t have the large, famous lakes that are loaded with 10 pound bass. But, we do have three watersheds, several lakes, and countless ponds that offer anglers the opportunity to catch largemouth bass. Lake Manatee, upper Myakka Lake, and Evers Lake are similar in several respects. All three start off as small, meandering streams with lakes that are created by dams. The water below the dams is either brackish or saltwater and is tidally influenced. While similar, each is a bit different and unique in its own way. All three have good populations of bass on the freshwater side and snook in the tidal portion. Lake Manatee lies off of State Road 64 about 10 miles east of I 75. It provides the drinking water for much of Sarasota and Manatee Counties. It is about 5 miles long and the major portion which runs from the State Road 64 bridge to the dam. Gilley’s Creek is the one main tributary. Lake Manatee tapers down east of the State Road 64 bridge, and after a mile or so takes on more of a river feel. Lake Manatee is fairly deep by Florida standards. It has holes that are over 50 feet deep. While there is ample shoreline cover, particularly on the east half of the lake, the Bass relate heavily to the channel edges. It kind of fish is like a northern impoundment. Outside corners and the submerged river channel with some cover on it are prime spots. Lake Manatee is also a good crappie and catfish lake. Bass will school up on Lake Manatee, busting baits on the surface. Anglers casting small top water lures and poppers can often times draw strike. However, more successful anglers will actually work the bottom using drop shot rigs and Carolina rigs. As with everywhere else in the country, a Texas rigged plastic worm will work as well. Bass spawn in January and February on most seasons. Gilley’s Creek is a prime area for betting bass. Channel runs very close on the southern shore near the mouth of the creek. The creek it shallower further up in with the decent sandy bottom. Anglers fishing the banks should do well from the post spawn up until late April. Early and late in the day are best times. Top water plugs work well at dusk and dawn. White and chartreuse spinner baits are a good choice during the day. If the bite on the bank is slow, it is best to drop off to the deeper water and work some of the channel edges with soft plastic baits. The water level in lake Manatee is regulated by the dam. This results in a fairly steady water level. The Manatee River downstream from the dam, while tidally influenced, is fairly fresh. Bass and other freshwater species will be found as far downstream as Fort Hamer. This section of the Manatee River is very scenic and can offer some fantastic Sarasota bass fishing. It takes a bit more effort to fish, as anglers need to put in downstream and work their way back up River. During periods of low water, there are shallow bars which will restrict all but the smallest of craft from getting by. The result is a very lightly pressured fishing spot. Lake Manatee is known more for crappie fishing than bass, to be perfectly honest. It has a good population of crappie, bluegill, and other panfish. Lake Manatee is the best lake in Sarasota for catching channel catfish, some of them quite large. Sunshine bass are stocked there as well. These are a striped bass/white bass hybrid. Anglers can access lake Manatee into places. There is of excellent surfaced ramp inside lake Manatee State Park. There is also a rough on surfaced ramp, basically a landing, right at the base of the State Road 64 bridge. Anglers fishing the river can put in at a small boat ramp at Ray’s Canoe Hideaway. There is an excellent surfaced ramp with parking and facilities at Fort Hamer Park. Evers Lake is conveniently located in Bradenton, just south of State Road 70 and a couple miles west of the interstate. Once again, there is a pretty little stream that flows in that is damned to create the reservoir. Evers Lake can be tough. It has a very uniform depth of about 15 feet. There is very little bottom contour, though there are a few underwater reefs. These reefs are fish magnets for anglers who know where they are located. There is an excellent shoreline vegetation and cover and Evers Lake. Several aerators placed near the dam, and these can be excellent spots as well. There are a couple shallower spots with lily pad fields that can be good spots in the spring. The Braden River flows upstream from Evers Lake for maybe 10 miles. However, it gets very shallow and narrow east of I 75. That stretch of the river between Evers Lake and I 75 can be quite productive. There are plenty of outside corners and a lot of submerged trees and structure. Boat docks are plentiful as well. Bass, tilapia, and panfish beds can be seen in the shallower portions of the river. Slow, finesse presentations work best in both the lake and the river. Because of its convenient location and excellent launching facility, Evers Lake in the Braden River could quite a bit of fishing pressure. Lighter lines, smaller baits in a more patient presentation is usually required. Baits like to 6 inch Senko work well. Night fishing can be an excellent alternative, especially in the warmer months. The Braden River below the dam flows for 5 miles or so and empties into the Manatee River. This stretch of the river holds mostly saltwater fish. It is a bit more developed than the Manatee River but still has some nice scenery. Fishing can be outstanding there in the winter! Schools of jack crevelle, some of them more than 10 pounds, move into the river in the fall. Snook also migrate from Tampa Bay to find sanctuary in the Braden River. There are sections of this River that are quite shallow. However, there are areas with 15 feet deep holes. Snook in jacks seek the sanctuary of this deeper water. Redfish, snapper, ladyfish and other saltwater species will be caught as well. Since bass are not really present and this section of the river I will skip over it. However anglers seeking more information on fishing this section of the Braden River can find it HERE. I run Sarasota fishing charters there. Anglers fishing Evers Lake in the upper portion of the Braden River can access it at Jiggs landing. There is an excellent boat ramp, dock, facilities, and a small shop selling snacks and bait. Anglers access the saltwater portion of the Braden River at the State Road 64 bridge. Myakka River State Park lies about 10 miles east of Sarasota off of State Road 72. It is a large area and in it is Upper Myakka Lake, Lower Myakka Lake, and the Myakka River. The best fishing is an upper Myakka Lake in the Myakka River between the upper leg and State Road 72. Lower Myakka Lake is very shallow and weedy. 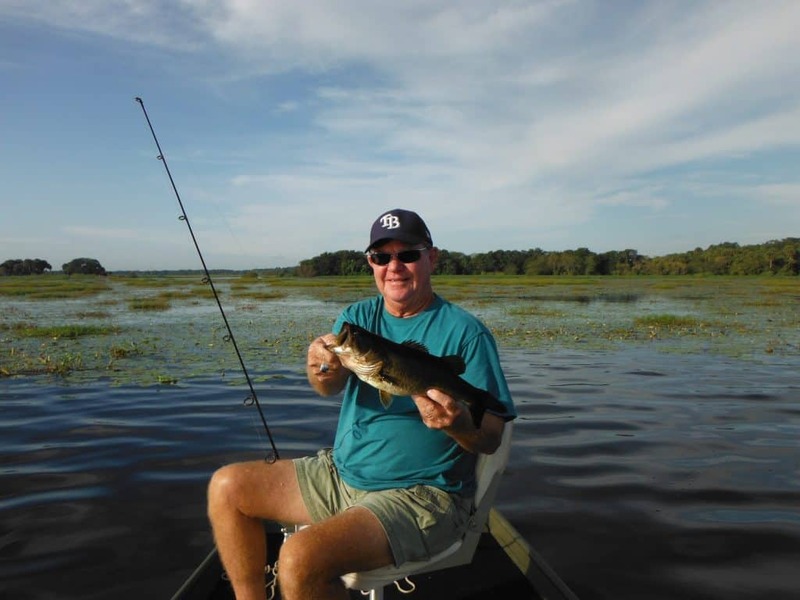 Upper Myakka Lake can offer some of the Sarasota best bass fishing around when conditions are right. The dam that creates upper Myakka Lake is a weir dam. That means it is simply a concrete wall and the dam cannot control the water level. The water level in the Myakka River system varies greatly. It floods in the summer and in the dry season the river can actually become a series of puddles. Upper Myakka Lake is typical of natural Florida lakes and that it is round and very shallow. During normal water levels, the lake is 45 feet deep. The Myakka River feeds the lake at the northeast corner and another Creek feeds it at the northwest corner. These can both be terrific spots when there’s a little rainfall and water is coming in from these creeks. 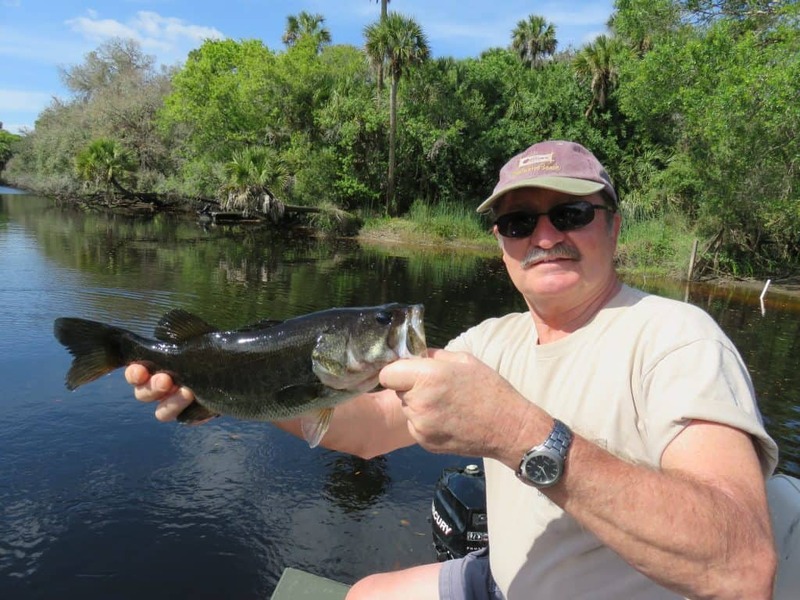 All of the traditional bass catching methods work well on upper Myakka Lake. Anglers fishing the grassy areas and edges can throw spinner baits, buzz baits, top water plugs, and soft plastic. Larger worms Texas rigged work well. The ideal condition is to have a foot or so of water above the submerged vegetation. Anglers and fish buzz baits, spinner baits, and top water plugs across the top. Bass will blowup through the weeds and anglers will experience some exciting strikes. I personally enjoy fishing the river between the dam and the State Road 72 bridge. The bass aren’t large and here but they are aggressive and there are plenty of them. Also, the scenery is unbelievable! You almost feel like you’re in the Amazon or someplace exotic. Access is limited to a couple areas and the park where canoes, kayaks and small boats can be manhandled into the water. But the effort is worth it as this area does not get a lot of fishing pressure. There is one issue with Upper Myakka Lake, and it frustrates us anglers. The biologist at the State Park have decided that the vegetation in the lake is invasive and they don’t want it there. Therefore, they spray the lake to kill the vegetation. This has a very detrimental impact on the fishing. Without this cover, bass, bream, and other fish are easy prey for the alligators and birds. The Myakka River below the lower lake is tidally influenced. In the cooler months, which is the best time to fish the river, the water is normally fairly low. Bass fishing from the lower leg all the way down to the bridge at US 41 can be excellent at times. This stretch of the river does not have a lot of access. Therefore, fishing pressure is light. There are quite a few kayakers, but not too many anglers. This stretch of the river is long perhaps 20 miles. The best time to fish is on a high, outgoing tide. I prefer to cast plugs is a allow me to cover a lot of water. If a productive stretch is located, I may slow down and fish it more thoroughly with a soft plastic bait. There is a decent boat ramp inside Myakka River State Park on the south end of upper Myakka Lake. It is surfaced but there is no dock. Boats 17 feet and shorter should have no problem under normal water level conditions. The only public ramp on the lower portion of the river as Snook Haven. There are kayak lunches at Myakka River Park and its sleeping turtles preserve. Benderson Lake is a reclaimed strip pit that has been converted into a world-class rowing facility. Competitors come from all over the country for events held here. It is fairly deep with underwater humps. The best approach when bass fishing is to work the shoreline early that switch to the offshore structure later. There is one boat ramp at the south end of Benderson Lake. It is a good, surfaced ramp with a nice little floating dock. There is ample parking and a clean porta potty. It is a trolling motor only or paddle only lake, no gas motors. There are countless ponds, small lakes, and retention ponds throughout the Sarasota Bradenton area. 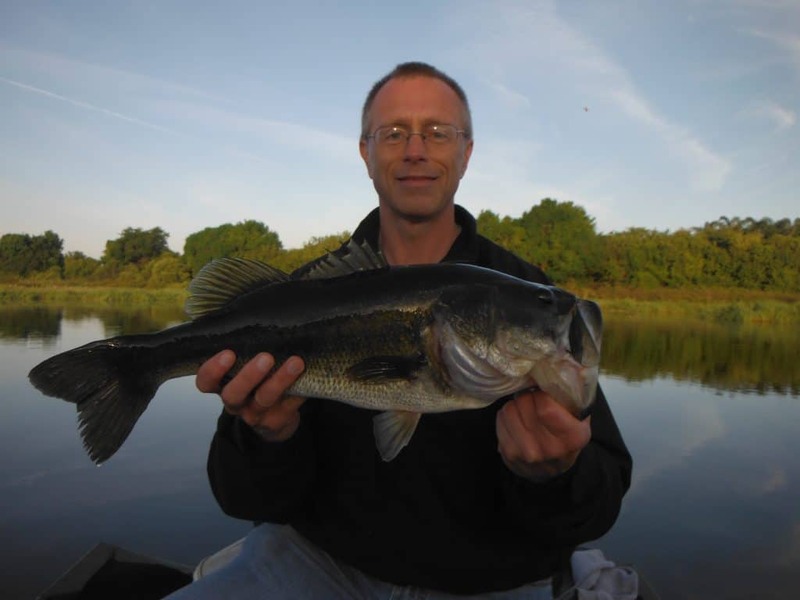 These ponds can offer some outstanding fishing for largemouth bass. Most of these are way too small for a boat and are fished by anglers walking the shoreline. Just about every residential neighborhood has at least a couple ponds, and most of them hold bass. Some are private and are usually posted. However, many are public and as long as anglers are courteous, they will be allowed to fish. Perhaps the best area for this type of fishing is a large development called Lakewood Ranch. It is east of the interstate between University Boulevard and State Road 64. A glance at Google Earth or any other Matt will reveal a myriad of small and medium-size ponds. Several of these areas are parks which have parking right near the ponds. Most all of them are public. There is a large lake right behind the movie theater in downtown Lakewood Ranch that has a lot a bass and it. My favorite lure for fishing the smaller ponds is a black Beetlespin. This is just a small spinner bait with a little black grub body. Soft plastics work well, especially finesse type worms such as the Senko. Light lines and smaller hooks will draw more strikes. Larger, noisier baits are less effective in the smaller bodies of water. Live shiners and nightcrawlers will produce for anglers who prefer a more relaxed approach and want to use live bait. Many bass anglers release everything they catch, and this is a great thing. 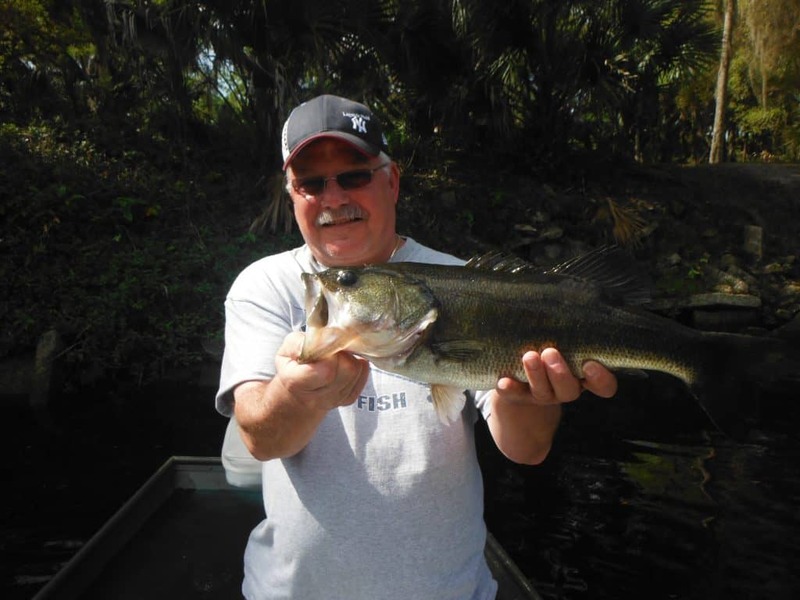 Florida has just changed the regulations regarding largemouth bass. There is no longer a minimum size. Anglers can keep five bass with one being over 16 inches. The reason for this is that they actually want some of the smaller fish harvested as the last few spawns have been very efficient. Check HERE for current Florida largemouth bass regulations.